Ah Vintage, you are a stunning creature. Just 18 and a half years old, reaching maturity, you are in full bloom. It is my pleasure to help others appreciate your wonder. The Vintage metagame is a special creature, but it takes a seasoned hand to help illuminate this beauty. Every quarter, just as corporate America is compiling and releasing earnings reports for investors and regulators, I am doing the same, but for the Vintage format. This is the most unusual metagame report I’ve ever composed. This is true for a number of reasons, but above all because of the sheer diversity in the Vintage metagame. This diversity manifests in a number of ways. For the first time ever no single archetype makes up more than roughly 12.5% of the Top 8 field! Those are Legacy-like numbers! Looking at the American metagame, there are 5 decks that make up more than 9% of the Top 8 field, but none make up more than 12.5%. Looking at the global Vintage metagame, there are 5 archetypes (different than the American metagame) that make up 7% or more of the Top 8 field, but, again, none make up more than 12.5% of Top 8s. That’s indicative of a really balanced field. Even among the top performing decks, it’s almost impossible to say which deck is “best.” That’s because, in the American metagame at least, the deck that has the most Top 8 appearances doesn’t have the most tournament victories. To complicate this, the deck with the most Top 4 appearances is neither the deck with the most tournament victories nor the most overall Top 8 appearances. In the global metagame, there does appear to be a slight frontrunner for best performing deck, but only by a hair, and there is a big group just behind the top deck. However, there is a much bigger, and more important story, and that’s the unbelievable diversity of strategic options among the control decks, particularly by engine. For the first time arguably in the history of Vintage, there is no consensus draw engine. Historically, there has been a single major blue draw engine around which most Vintage control decks are built. In 2001, it was Fact or Fiction. In 2002-2003, it was Gush. After Gush hit the Restricted List, in the second half of 2003 to the first half of 2004, the de facto draw engine was Intuition coupled with Accumulated Knowledge. In second half of 2004-2005, it was Thirst For Knowledge. With the printing of Gifts Ungiven, it became Gifts, eventually supported with Merchant Scroll (until Gifts landed on the Restricted List). Then when Gush was unrestricted in 2007, it was the entire Gush-Bond engine of Gush, Scroll, Brainstorm, and Ponder. When all of those cards were restricted and Time Vault was errated, Thirst For Knowledge in the Tezzeret decks arguably dominated the format (more like ruled with an iron fist) until Thirst was restricted. Thus began the era of Dark Confidant Tezzeret decks. But with both the printing of Jace, the Mind Sculptor and Gush once again unrestricted in 2010, things began to diversify, and that process has now run its course to deliver the metagame we see unfolding before our eyes. Neither Confidant (aka Bob), nor Gush, nor Jace, nor Tezzeret are dominant at this time. Instead, each of these cards competes with each other, and they bring with them a litany of other tactical engines and strategic approaches. The multiplicity of tools actually generated an exponentially greater (and in fact dizzying) array of configurations. I have seen each and every one of these cards in various control decks. I have never seen more tactical options being deployed. Mystic Remora with Repeal and Mindbreak Trap is very popular combination in Europe, and appear in a huge swath of Bob/Jace control decks. They also appear in decks without Dark Confidant, often in the Storm and/or Gush variety. You can mix and match most of these cards and you can find them in a Vintage Top 8 control deck somewhere. Consider the simple, and highly popular, combination of Dark Confidant control decks using Jace. Jace and Dark Confidant synergize much as Merchant Scroll and Gifts did in an earlier Vintage era. Just as Scroll helped the Gifts player develop the resources to cast and resolve Gifts, Bob does the same for Jace while serving as a buffer on the ground for unwanted attacks. However, Jace has largely pushed Tezzeret out of Dark Confidant decks, and as a consequence Tezzeret has appeared in an offshoot archetype known as Turbo Tezzeret. The 2010 unrestriction of Gush took some of the metagame pie from Bob, who now competes with Gush to support Jace. One complaint might be that, while it is true that there is more tactical diversity than ever before, the strategic ends are more uniform. To some extent this is true, but only in a very narrow sense of actual win conditions. It’s true that the vast majority of these decks use the same victory conditions: a Tinker “robot,” Tendrils of Agony, Empty the Warrens, Jace or Tezzeret’s ultimate, or something along those lines. While the actual win conditions are more limited, the actual strategic approaches are almost as varied as the tactics upon which they are built. Strategically, the Bob/Jace decks, the Gush control decks, the Oath of Druids decks, the Painter’s Servant decks, the Turbo Tezzeret decks, and the more pure control decks are very, very different. They may share many victory conditions, simply because of the sheer efficiency of cards like Tendrils of Tinker, but their actual plans are hugely distinct. The fact that many of these decks share Tinker + robot and Jace as potential win condition is as deceiving as the fact that they share Moxen and dual lands. These decks are truly different animals in terms of in-game decisions and tactical lines of play. With those observations out of the way, let’s look at the top performing decks. I have aggregated all of the globally reported tournament results with 20 or more players and a Top 8 into a single report to identify top performing decks in the Vintage metagame. Please see Appendix A for links to the tournament data. Once called “Tezzeret Control,” this basic strategy has won the last two Vintage Championships (hosted at GenCon annually every August), in 2009 under Hiromichi Itou, and most recently in 2010 by Owen Turtenwald. Paul’s deck is clearly a derivative of both lists. The main difference is that Paul has incorporated much of the “Vintage Control” deck’s Preordain/Ancient Grudge package into it, popularized by none other than Brian Demars. Consequently, Paul runs Ancient Grudge instead of the Nature’s Claim and Trygon Predator’s that Owen ran, and Preordains instead of Spell Pierce. Most of the European versions of this deck retain the original configurations of Predator/Spell Pierce, much like their antecedents. The European versions of the deck feature at least two Jaces, as well. This deck is arguably the strongest deck in Vintage in because of Dark Confidant. Dark Confidant is arguably the most successful draw engine in Vintage, and highly synergistic with Jace. This deck’s access to any color in Magic gives it a powerful array of tactical and strategic options to combat any menace without sacrificing mana stability, at least in terms of ability to find certain colors in the relevant time frame. This build or something similar has to be considered a front runner for winning the Vintage Championship again in 2011. This deck is fast and brutal, and maxes out on Sphere effects for maximum tempo value and immediate mana denial impact. Thorn of Amethyst and Lodestone Golem nudge this archetype into an aggressive posture, making it more attractive to go for the throat rather than an attempt a hard lock. The tempo plays of Golem and company make it difficult for opponents to recover as Sphere effects pile up to lock the opponent out just long enough to win the game. Phyrexian Revoker has become a staple component of these decks, denying the opponent access to both artifact mana as well as tactical or strategic plays such as Time Vault or Jace. Sculpting Steel has, in recent months, been replaced by Phyrexian Metamorph, but the principle is the same. The most recent, and successful, version of the deck to emerge in the United States uses Slash Panther as an anti-Jace tactic (since it has haste) and for superior tempo and fast pressure. Note that I have recommended a similar list upon which this appears to be based, but with Tangle Wire over maindeck Precursor Golem. There remains considerable variability in the Dredge archetype, such that it may be worthwhile to generate a composite list to better analyze trending card choices. It may be odd to see a Dredge list without Chalice of the Void or additional forms of disruption, but that is the current trend. It seems like the Fatestitcher Dredge lists are in vogue. These lists pack less disruption, but feature more speed and fast mana, conserving sideboard space in the process. Fatestitcher is a tactic that can untap a Bazaar for additional dredging power or reuse other resources. Sun Titan is equally versatile, and provides an additional post-Dread Return boost by putting lands directly into play (fueling Bloodghast), or other accelerants, like Fatestitcher (fueling more Bazaar activations and potential Dread Returns). The additional Blue mana accelerants, like Lion’s Eye Diamond and Lotus Petal, are included over Chalice, to help utilize Fatestitcher. The result is a trade off of disruption for speed. Given the cyclical nature of the archetype, I expect Dredge to return to earth in the next quarter, particularly as people pack on additional Dredge hate. Oddly enough, the vast majority of Gush-based decks have converged around this essential archetype, which tends to feature Time Vault, a few Jaces, Tinker, and an Empty the Warrens or Tendrils as another win condition. They tend to have 3 Mana Drains, 2-3 Duress/Thoughtseizes, 1-3 Jaces, and 2-4 Preordains. In many ways, this is simply the Bob/Jace Time Vault strategy, but with the Gush-bond engine instead of Dark Confidant. The trade off isn’t clear in terms of what you get and what you lose. It seems that the Gush deck gets an alternative storm kill, the benefit of Fastbond, better use of Preordain, and expensive sideboard cards like Ingot Chewer. The Bob decks, though, seem to have more mana stability, and the threat of Dark Confidant itself, which is also arguably a better draw engine than Gush, if the life can be properly managed. Both decks feature different kinds of explosiveness. The Bob decks have big mana plays that can be accelerated out early given the density of artifact acceleration and cards like Tolarian Academy. The Gush decks, on the other hand, have the explosiveness of Fastbond, while lacking cards like Mana Vault and Academy. Shawn’s list features Mental Misstep, a new development which is not present in the European metagame in Gush Control decks (although Europeans do play Mental Misstep), which is much more heavily influenced by Workshop decks. Consequently, the European lists tend to run cards like Repeal more often in that slot. The American lists are more likely to run Imperial Seal and the European lists seem more likely to have Regrowth, although there are counterexamples. I expect this kind of decklist to become more popular in the American metagame, which has a smaller presence of Mishra’s Workshop decks. Many top American players will gravitate towards Gush decks, and this Gush deck gives the pilot many of the best toys in Vintage. This deck’s strategy is clear: accelerate out a Tezzeret and win the game. What’s innovative about this dedicated Time Vault deck is that it maxes out on tertiary artifact acceleration such as Grim Monolith (and others also use Mox Opal) to compete with Workshop decks, and to create a significant early game mana advantage to fuel early Tezzerets, and to potentially bypass opposing Spell Pierces. A full complement of Voltaic Key is deployed both to synergize with Grim Monolith and Sensei’s Divining Top, and also to ensure that a single Tezzeret activation will win the game (finding Time Vault which can be activated immediately for infinite turns). The advantage of this deck is the focused use of Tezzeret and the lethal combo upon its resolution. As an answer to Workshop decks, there was perhaps no better deck given the mana stability and artifact acceleration it is built upon. However, Workshop decks are now supported with Phyrexian Revoker and, in some cases, Null Rod, making this a risky strategy. In addition, the increasing use of Ancient Grudge, at least in the American metagame, makes this deck a one-hit wonder that is singularly vulnerable to a silver bullet. It remains to be seen whether this is a deck that can continue to compete in the metagame going forward, or has outlived its relevance. Nat’s list uses Chalice instead of Null Rod to slow the opponent’s mana development, and as a consequence benefits from the synergy between Aether Vial and cards like Leonin Relic-Warder for surprise value. Voidmage Prodigy is an innovative solution to traditional problems, and benefits tremendously from Vial. There are a wide range of Oath strategies currently employed in Vintage, and this is the most popular, the so-called “Golden Gun” variant, known for its one-shot win capacity, post-Oathing. This variant is able to win in a single turn because it can equip either Emrakul or Blightsteel Colossus with Dragon’s Breath upon entering the battlefield, and effectively end the game with one swing. Iona/Elephant Oath lists, utilizing Iona, Shield of Emeria and Terastodon as their creatures of choice, continue to make appearances as the second most popular variant, and Tyrant Oath (utilizing Tidespout Tyrant) also has made appearances, supported by Gush. The greatest strength of Oath is its ability to combat Workshop Aggro decks by resolving a two mana enchantment. It also features strong mana stability, and secondary draw engines like Jace and Preordain, which also synergize with the primary plan. The weakness of Oath decks lies in the control mirror, where Oath is sometimes a frustrating “do nothing” because it does not directly interact on the stack. Like Golden Gun Oath, this variant features Dragon’s Breath. But unlike it, it has several other ways to accelerate out Emrakul, including Channel and Show and Tell. This could be a dark horse for the American metagame in the coming months. Kudos to Omar for coming up with such a cool deck. None of the following decks cracked more than 5% of the global Vintage Top 8 metagame, but they were notable presences, and are worth mentioning. As you can see, this deck is built around Remora, and uses Repeal and Mindbreak Traps to reinforce itself. Many of the Remora lists use these tools but in the Bob/Jace deck, and in lesser quantities. These decks may be quite strong in Gush metagames, as Remora rewards you for your opponent doing nearly anything other than playing land. These decks typically use Forgemaster as a kind of toolbox engine, and include more singletons than usual for maximum lockage. These decks aren’t pure Workshop Control decks, and aren’t focused Aggro machines either. They are sort of mid-range hybrid Workshop decks with a Survival of the Fittest-like combo. The Painter decks in many ways resemble the Bob/Jace Control decks, with Bobs, Jaces, and Drains/Forces. However, they differ in that they typically run a complement of Red Elemental Blasts, and instead of the Time Vault combo, they run Painter’s Servant and Grindstone. Some of the Painter lists also run Trinket Mage, to help assemble the combo. Painter’s Servant is a huge threat in the control mirror, and can slip by a Lodestone Golem, making it a potent option. The signature elements of this deck are: 1) multiple City of Brass, 2) Ancient Grudge, 3) Preordains, 4) Jace, but no Gush or Dark Confidant. Both Dark Confidant and Gush preclude City of Brass as a reliable mana source, and City of Brass is what gives this deck it’s control power, enabling the use of any card in the Magic card pool. This deck is the descendent of The Deck, and a true metagame weapon, to be tuned to defeat any particular metagame, but no general one. The key distinguishing features of Workshop Control are most obviously Smokestack, but an increased presence of Crucible of Worlds and Karn. The hallmark feature of so-called “Espresso” or “NY Stax” is Serum Powder for mana and opening hand consistency. This deck remains only slightly behind Workshop Aggro in the Q2 American metagame, but far behind Workshop Aggro globally. It will be played in the Vintage Championship by its adherents. Vintage Control aka Demars Control aka The Deck does appear to be largely an American phenomena. 66% of the Top 8 appearances of this archetype appeared in American tournaments. Workshop Aggro is largely a European phenomenon. 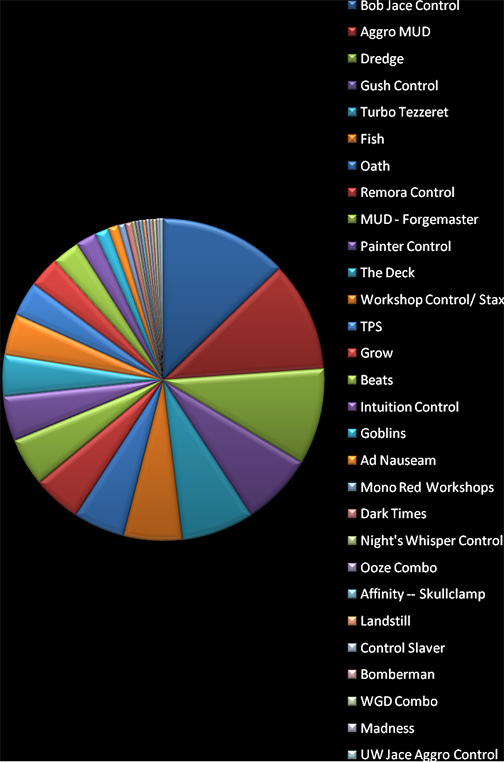 Over 80% of the Top 8 appearances by Workshop Aggro decks happened in European tournaments. Conversely, Workshop Control (i.e. Stax decks) are largely an American phenomena. 40% of the Workshop Control decks were American. Notably, however, Workshop Aggro and Workshop control put up roughly equal Top 8 appearances in the United States. Similarly, a very popular Workshop variant built around Kuldotha Forgemaster is entirely a European phenomena, despite making up almost 5% of all Top 8s. Four very popular control variants: Turbo Tezzeret, Painter Control, Remora Control, and Intuition Control are predominantly or almost entirely European decks. Turbo Tezzeret and Painter are very popular in the European metagame, but only 14% of Turbo Tezzeret decks and 7% of Painter decks come from American Top 8s. Similarly, Remora decks are very popular in Europe, but see almost no play in the United States. They are almost entirely a European phenomena. Contrary to conventional wisdom, Gush decks, especially Gush Control decks, are overrepresented in the United States, making 33% of the total Gush Control decks in Top 8s. Gush decks are more popular and successful in the United States than overseas. The last major difference is that Dark Ritual Storm decks are almost entirely European now. Neither Ad Nauseam nor TPS apparently exist in the United States, at least according to the most recent tournament results. This could simply be a function of the number of tournament results reported overseas. Bob/Jace Control, Oath, and Dredge are roughly evenly distributed and represented among the two metagames. By almost any measure, Vintage is a healthy format with a diverse array of strategic and tactical options, an evolving and fluid metagame, and popular tournament competition despite both the anemic support for the format and enormous cost of entry. The Vintage metagame is continuing to evolve and incorporate new technology at a rapid pace, both as a result of deck design innovation and useful printings from new sets. But these developments can be discarded as quickly as they appeared if they do not sustain tournament performance. The Vintage format benefits at the moment from a balanced Restricted List policy that has carefully excised problem cards while reintroducing old playables through unrestriction. The long dominance of Workshop decks since the printing of Lodestone Golem has appeared to finally subside, and in its place we have a multiplicity of multicolor Blue based control decks competing against each other, with wide ranging strategic approaches represented. The hybrid nature of many of these shells makes them not only difficult to classify and sort, but represents a sharp break from recent history. The decks of 2009 no longer exist in the same form, and instead we have a relatively new era of Vintage. The most obvious manifestation of this trend is the fracture among Blue based control, and particularly, Time Vault strategies. While Dark Confidant is currently the most successful, it is closely followed by Gush, and then a host of other draw engines from Mystic Remora to Intuition. And, rejecting these engines altogether is Demars Control, which relies just on Jace and Preordain, around a rock solid multi-color mana base with strong tactical support. Orbiting these focused decks are orthogonal strategies like Oath, Painter, and Turbo Tezzeret, which share many tactics, but approach the metagame from different angles. The diversification of strategic approaches and tactical elements is not confined to Blue based control or combo-control, but really can be found throughout the format. Workshop decks are so badly splintered that categorization is messy at best, although we can discern Aggro, Control, and Forgemaster variants among the din. Similarly, the Fish and Beats archetypes remain splintered by colors and tactics, and there appears to be little consensus on even basic questions such as whether to run a card like Spell Pierce. Even seemingly stable archetypes like Dredge or Oath exhibit tremendous variations such that simple or simplistic classification schemes risk miscommunication regarding tactical strengths or weaknesses. The diversity in the current metagame is a challenge for successful metagamers like Brian Demars, but a Petri dish for innovation and creativity. It is a crucible for nonconformist minds that seek to bend the format to their will by introducing unexpected and unforeseen elements to a messy environment. Good examples are the Show and Oath deck by Omar that could shock a tournament with a surprise victory, the Slash Panther Workshop deck, or the now waning Turbo Tezzeret. This is arguably the difference between the super diverse Vintage and Legacy metagames. The Vintage metagame is diverse, but not in a settled pattern. It has been nearly a decade since I have seen a Vintage metagame more vulnerable to disruptive forces of creative destruction. The totems of the past are no longer as demanding of allegiance, whether they be Time Vault or Yawgmoth’s Will, and recent upstarts like Jace or Lodestone Golem have failed to lasso the format, which seems too slippery to yield their demands. There are not only more viable strategic options than ever, but the tactical choices are equally confounding. How does one decide among Spell Pierce, Thoughtseize, Duress, Mental Misstep, Mystic Remora, Flusterstorm, Vendilion Clique, Mindbreak Trap, Negate, Misdirection, or Mana Drain? And how does one weigh these cards against cards like Gitaxian Probe, Preordain, Gifts Ungiven, Thirst For Knowledge, or additional Jaces? Some players run Ponder, others don’t. Some run Imperial Seal and Regrowth, others don’t. We have also arrived at a moment in time where deck construction demands something more than a singleton Hurkyl’s Recall, but that bona fide artifact removal seems like an essential part of deck construction, just as it was in 1994, when Brian Weissman and others played 4 Disenchants main deck. Today’s Disenchants are Nature’s Claim, Steel Sabotage, Trygon Predator, and the now ubiquitous Ancient Grudge. Now is an exciting time to be playing Vintage.